When talking to a documentary interviewer about the experience of the Acid Tests and how these mid-’60s, mixed-media events in San Francisco were the essential forge for the hippie counter-culture, Grateful Dead guitarist Jerry Garcia zeroed in on the freedom that was afford the group as the Tests’ house band. The ultimate value of the Acid Tests, as Garcia saw it, was how they allowed the band to slowly discover the order that follows chaos, the form that grows out of formlessness. Many might think this the schizo ramblings of an often-addled, inveterate bohemian, but two generations later, the hipster members of New York art-rock experimenters Animal Collective seem to have hit upon the same logic. After years on the indie-rock fringe, dabbling in various styles of musical abstraction over the course of more than two dozen albums, EPs, singles and solo projects, the group’s new album, “Merriweather Post Pavilion,” finds these insistent sonic tinkerers engaged in a full-on embrace of cheery, pop music formulas. It’s a new order that should propel to the band to the forefront of the rock underground. Part of the reason Animal Collective became many music bloggers’ pet group during the latter half of the Bush administration was the obscurity of their avant-garde music as well as the difficulty in succinctly categorizing their myriad of albums. For most of band’s decade-long time together, the loosely organized troupe — consisting of nicknamed band members Avey Tare (David Portner), Panda Bear (Noah Lennox) and Geologist (Brian Weitz) — wavered between brain-fried arrangements that suggested neo-psychedelia, noise-rock, electronica and even folk music. The combo functioned more as a cell of Baltimore expatriates engaged in an erratically evolving art project in the Brooklyn scene than a proper band. This made each album a singular experience, but kept Animal Collective from developing a coherent voice or earning them wider acceptance. This perception began to change with the release of 2007’s “Strawberry Jam,” which elicited the strongest notices of the group’s career. The songs coalesce around the concept of the four-piece unit without abandoning their penchant for piling on blitzed-out instrumental tracks. An even more profound indicator of the Collective’s musical maturity was Panda Bear’s “Person Pitch,” which landed on most critics’ lists as one of the best records of the year. Left to his own devices, Panda Bear tuned into his inner Brian Wilson and produced more than a handful of dense, digital soundscapes that could’ve comfortably served as space-age background music in Phil Spector’s mind. Sometimes disorienting in their convoluted, multi-tracked presentation, each song’s roar of Beach Boy harmonies eventually settled into an easy melody and clear likeability. If Amy Winehouse and producer Mark Ronson were really just Motown re-enactors on her debut, Panda Bear was on entirely different path. He took an established form, carved up its core properties on his computer and transmutated it into a vision of our near future. He propelled listeners to a world they hadn’t yet heard but that was strikingly familiar. The recent exit of the group’s fourth member, Josh Dibb (AKA Deakin), who has taken a sabbatical from the Collective, seems to have allowed the remaining trio to gravitate closer toward Panda Bear’s sensibilities on “Merriweather.” In a word, the album is a breakthrough. The euphoric album consists of mostly contemplative, midtempo numbers that focuses more specifically on the vocals than their previous discs. The emphasis on the group’s singers is a natural source of unity for each sonic mashups, lending the entire record a greater sense of cohesiveness overall. This might be the closest Animal Collective can come to an audition for “American Idol” crowd while maintaining the semblance of their old habits and disjointed musical world view. 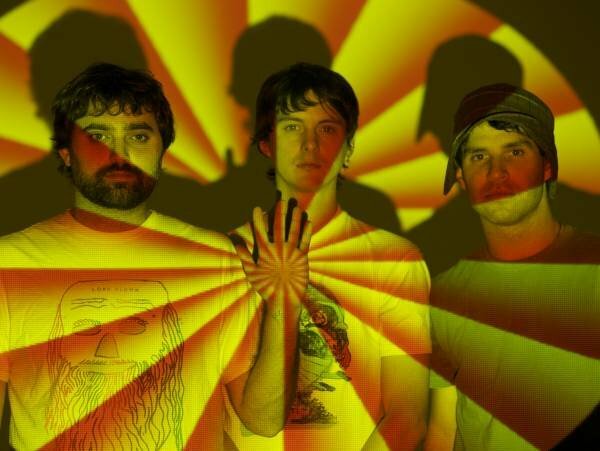 Listeners can hear the extent of Animal Collective’s transformation with the CD’s second track, “My Girls,” which is easily the most jaw-dropping recording released in the still-young 2009. The song is a multi-layered titan that slowly expands in scope as a mosaic of keyboard and synthesizer parts and overlapping vocals formulate into a whole and refracts a glorious melody. The track is most unlikely pop single since Kanye West’s “Love Lockdown,” but is even more gorgeous than the crown jewels of “Person Pitch.” A mechanized Ric Flair yelp that bubbles up at the song’s climax is a call to celebrate despite our encroaching suspicions that this recession will end up being a depression. “Does the music that I make play on my awkward face?” Avey Tate sings on computerized blues of “Taste,” but the sounds coming from his mouth are taking the backseat on this LP. Again and again, it’s the Panda Bear-led material that seems to lead the pack. While never explicitly replicating the otherworldly glories of “Person Pitch,” he guides his bandmates to compositional techniques the he rediscovered. “Guys Eyes” is an elegant maze of intertwining voices and psychedelic effects that just grows in strength each time it turns in on itself. Just as the mood changes, Panda or the others will reference back to an earlier vocal motif and another layer will be added to the collage. Panda doesn’t need his chums help on “Daily Routine,” in which he instead relies on some evil-sounding, Capt. Nemo organ work. The skittering, whirlwind of keyboards takes the spot of a second vocalist, a counterpart amid his echo-laden paeans. Rather than the parrot on his shoulder, the organ restarts the melody for another verse or interrupts the flow such that he can take listeners deeper down the rabbit hole. The complicated nature of each track occasionally does keep certain cuts from living up to their full potential. “Bluish” is an unusual love song in that is nearly overtaken by its amalgamation of influences. With the percussion not all that different from a click track, it blends David Gilmour’s wavy, majestic guitar lines from Pink Floyd’s “Dark Side Of The Moon” with a plaintive vocal that recalls at times the Flaming Lips’ Wayne Coyne and then Jane’s Addiction’s Perry Farrell. This ditty will only sweep her off her feet if she has a great record collection. It’s the simple melodic ideas that the members of Animal Collective hit upon that make “Merriweather” a thrilling listen and benchmark for the band. “Open up your throat,” the band members call out on “Brother Sport,” and unlike so many of their previous albums, this record offers so many opportunities to sing along. The form that the band has discovered certainly aligns them with popular tastes more so than the band members might be used to or comfortable with. However, it’s a formula that ultimately allows others to join in more easily. Like the Acid Tests, the germ of a unique counter-culture Animal Collective had created is now poised to be mass culture. Tags: "Merriweather Post Pavilion", Animal Collective, Avey Tare, Geologist, Josh Dibb, Panda Bear, review. Bookmark the permalink.